Medics not afraid of being fired! The BVI Medical Doctors Association has dismissed suggestions that its members acted unethically and illegally when they participated in a ‘sick out’ in the Emergency Room at Peebles Hospital on Monday. It added that the medical practitioners are also not worried about being victimized or even fired. Under 20 medical practitioners participated in the ‘sick out’ as they called for an end to ‘discrepancies’ in compensation from their employer – the state-owned BVI Health Services Authority (BVIHSA). 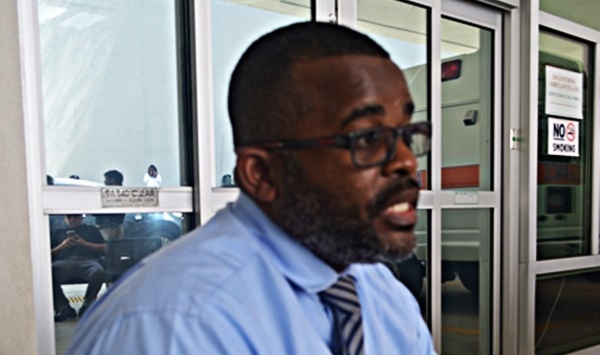 “The sick out was not illegal; it was not unethical,” declared Vice-president of the Medical Doctors Association Dr Craig Stoutt, who noted that the ‘sick out’ only lasted for a few hours on Monday, February 20. He further told BVI News Online that a few non-emergency services at Peebles Hospital were affected ‘minimally’ during the ‘sick out’. But Dr Stoutt noted that, despite being ‘sick’, the medical practitioners were on stand-by in the event their services were needed for emergency cases. “The sick out stopped on Monday. And, even though it was a sick out, services were never really curtailed. I did some cases in theater on Monday. We could have stayed at home with the sick out, but we decided to stay at the hospital in case of any dire emergencies we could be there to assist. We were right there on the site. I don’t see how that was unethical. We didn’t put anybody in harm’s way,” Dr Stoutt reasoned. Dr Stoutt said medical practitioners are allowed sick leave, and, to prove they are sick, they needed to have been examined. That, he claimed, is what was done on Monday. Dr Stoutt went on to dismiss suggestions that the ‘sick out’ may have been a breach of the medical practitioners’ contracts. In that regard, he claimed that many of the contracts were signed under ‘duress’. While admitting that more members of the medical staff did not participate in the ‘sick out’ because they fear being victimized, Dr Stoutt told BVI News Online that those who participated have no such fear. Dr Stoutt further stated that, if members of the medical staff are fired, the world will become aware of that fact, and persons would be reluctant to leave their homeland to practice in the British Virgin Islands. “The world is a global village and everybody knows what’s happening. We all have colleagues. Who is gonna leave their families to come here to work for next to nothing? What quality of physician you (BVIHSA) gonna get?” Dr Stoutt further said. The medical practitioners are pressing the BVIHSA for – among other things – the implementation of standardized salary scales, the payment of a standard on-call allowance, an end to late payment of gratuity, timely renewal of employment contracts, and the payment of housing allowance also to employees who are not expatriates.